When two young girls, who happened to be a lesbian couple, had their innocent date night turn into an assault and murder, the world turned for a moment and looked in the direction of that tragedy. We all recognized the crime for one of hate and senselessness and as Mary Kristine Chapa makes a slow and determined recovery, her sweet girl Mollie Olgin lays silently at rest following a quiet ceremony with friends and family in attendance. One life ending in a blink of an eye and the other forever altered by someone who just happened to have a need to kill. In a dark theatre in Colorado couples and families and friends lost themselves in the magic of the movies. There is no safer haven than a darkened theatre where we leave our troubles behind and venture into another place and time. Shoulder to shoulder, eating overpriced popcorn with like minded movie goers; anticipating what that screen might show us next. Then suddenly and without reason – in a bloody horrific span of moments – carnage rages into a horrifying reality from within the auditorium. Screams are real and Dolby sound falls mute compared to the cries of the innocent. Blood is warm and bullets fire randomly and unforgivingly as they pierce unarmored skin – but not like in the movies. This does not end – there are no credits rolling to an amazing soundtrack – the aftermath is dark and unacceptable – forever and ever. Death comes quickly to some and lingers relentlessly for others. No pause button, no rewind, no technical malfunctions. Someone decided it was a time to kill – and without thought, trepidation, conscience or hesitation – they did just that. Three masked men went into a 33 year old lesbian’s home in Nebraska where they tied her up, mutilated her and left her to burn alive. 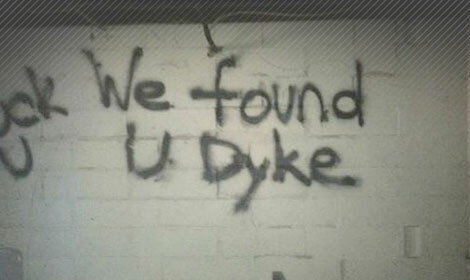 Outside her home, the words, “We Found U Dyke” were spray painted on her fence. A knife was used to carve anti gay slurs on her arms and abdomen. This openly gay woman found a way to rise to her feet and run naked and bloody to her neighbor’s home where the police were notified. An innocent woman inside her home in the middle of Nebraska – victimized and brutalized by those that felt the need to kill. What drives the human spirit to become so deranged that it takes on the role of killer? What holds up, digs deep and festers inside of people who hurt, defame, control, torture and kill the innocent? I can’t imagine – I can’t understand. I try and try and try and there is no clear and simple answer. I need to understand – to make rhyme or reason out of unexplainable acts torments me from the inside out. I did not know any of these victims personally – and yet – in a way – we all know each and every one of them. They are us and we are them – and in all the chaos that defines senseless acts of violence and hate for each other must lay the belief that we are better than this. That good certainly does out number bad. That compassion and forgiveness trump intolerance and hate. That people are innately good and, God willing, it will all make sense to us in the end. I, too, believe in the innate goodness of people. But evil exists in this world, and gains more ground every day it seems. How do we conquer it? We don’t seek revenge, we don’t meet violence with more violence, we find that still quiet place inside and…pray for peace. For only love can conquer hate. Another great article. Keep up the great work.It makes us think how precious life is. I don’t think anything will really change until our society makes a concerted effort to eliminate all the hatred that is exposed in the media which seems to thrive on these horrendous situations. Articles like yours will help make that change. It can be hard to find words in the face of these horrific events, but this was beautifully written. Truly.